This quiche is a little more work than a standard frittata, but if you’ve been hankering for something with a real crust to it, spaghetti squash is the perfect answer. It’s mild enough to stand in for pastry dough without adding any unexpected flavor, and so much healthier than a nut-flour crust. If you’re struggling to cut it open without slicing your fingers off, just poke a few holes in the rind and bake it until it’s soft. Then cut it in half and test for softness. If it’s soft all the way through, scoop out the seeds and continue with the recipe. If it’s still hard in the middle, place the halves face down on a baking sheet and continue baking until it’s soft. When you remove the squash with a fork, it should come out in “strands” that look like spaghetti (hence the name). This is normal. As the squash sits, it may release some water into the bowl. If this happens, just drain out that water before you put the squash into the pie dish. All those instructions make it sound harder than it is; cooking with spaghetti squash is one of those things that sounds complicated to read about but actually isn’t hard to do. And after that, the rest of the recipe couldn’t be easier: if you can make scrambled eggs, you can make the filling for this quiche. 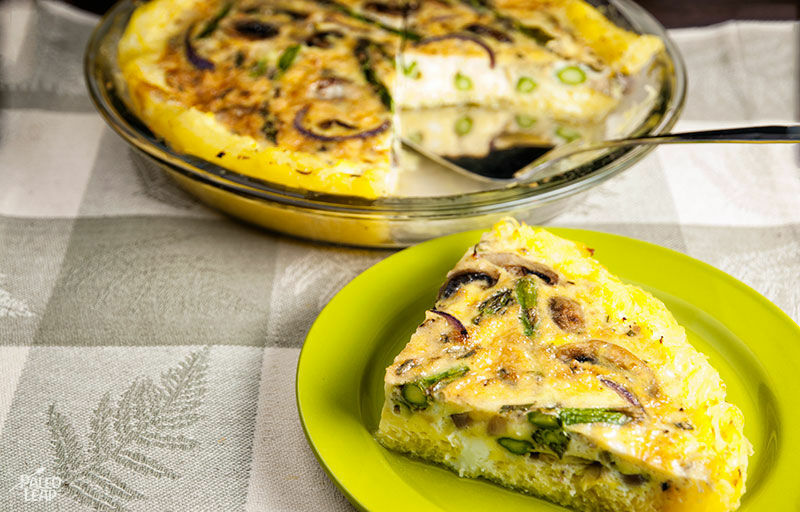 Like all baked-egg style dishes, this one is easy to modify. Add or leave out whatever vegetables you like, or throw in some pre-cooked meat (bacon, anyone?) for extra flavor. And as always, don’t forget the value of meals like this as make-ahead breakfasts: if you make an extra recipe at dinnertime, you’ll have breakfast for the next couple days all ready to go! SERVES: 4 PREP: 15 min. COOK: 1 h 10 min. Cut the squash in half, remove the seeds, and place, face down on, a baking sheet. Bake for 30 minutes, then remove from the oven, and set aside to cool. Remove the flesh of the squash using a fork and set aside in a bowl. Sauté the onions and garlic until the onions are soft. 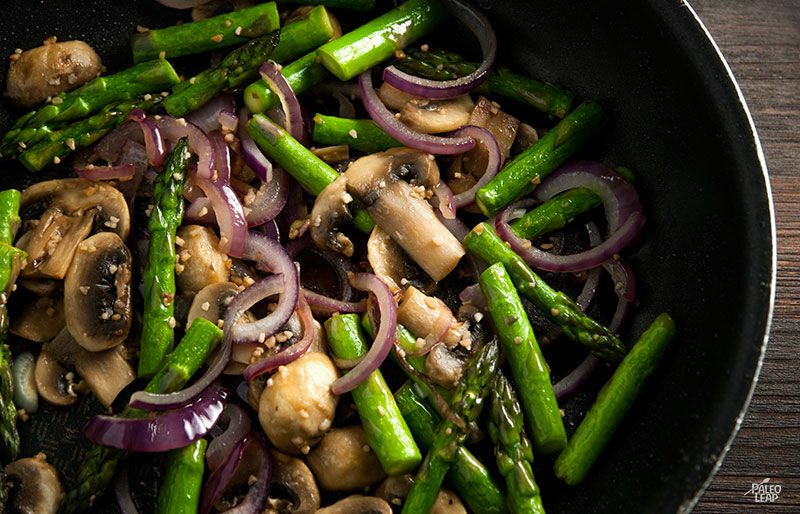 Add the asparagus and mushrooms; continue cooking until the asparagus is starting to get soft but still crunchy (watch for the moment it starts to change color). In a bowl, whisk together the eggs, coconut milk, rosemary, and season with salt and pepper to taste. Make the “crust” of your quiche by lining a deep pie dish with the cooked spaghetti squash, pressing gently on the bottom and sides to make it even. Pour the egg mixture over the squash and add the asparagus and mushrooms on top of the eggs.